We discovered Amsterdam for you! Amsterdam, the largest and most famous city of the Netherlands. Enjoy Amsterdam from one of our carefully selected shortstay city apartments. We have gathered some Amsterdam city info that might be useful during your upcoming city trip. Amsterdam has more than a dozen world-class museums. 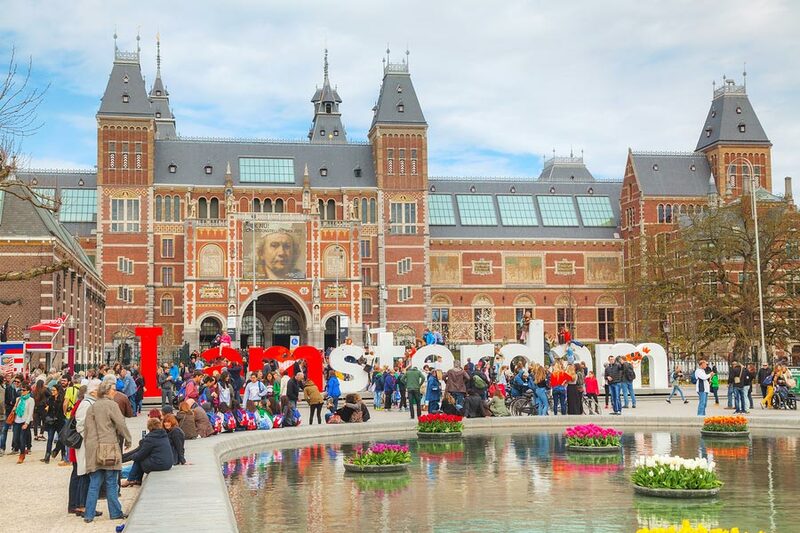 From the Rijksmuseum and the Hermitage to the Anne Frank House and van Gogh Museum, the city offers plenty of cultural, historic and artistic inspiration. There are also another 40 plus unique museums and cultural treasures awaiting discovery. We at Amsterdamapartments.com have assembled a short list of some of the city’s finest as well as more unusual museum visitor attractions. Nederlands Het Scheepvaart – National Maritime Museum. Located just a short walk to the east of Central Station, this impressive multimedia museum houses a 60,000 volume maritime library as well as an excellent restaurant and museum shop. The recently renovated beautiful museum building dates from 1656 whilst the excellent interactive exhibits make this one of the best visitor attractions in the city. Exhibit information is presented in Dutch and English and offers a unique insight on the history of the Netherlands, its people and their complex relationship with water and the seas. Het Scheepvaartmuseum, Kattenburgerplein 1, Amsterdam. Tel: +31 20 523 22 22. Rembrandthuis – The home of Rembrandt. Located in the Nieuwmarkt area of the city alongside the Waterlooplein Market, this house was once the home of the famous artist Rembrandt van Rijn. He and his wife lived in the house from about 1639 to 1658 and it is where he more than likely painted at least one of his most famous works including ‘De Nachtwacht’. Today the museum exhibits 250 of his etchings as well as a number of his sketches. Paintings by his skilled teacher Pieter Lastman are also on show here. Demonstrations of 17th century etching and paint preparation techniques are also provided. Rembrandthuis, Jodenbreestraat 4, Amsterdam. Tel: +31 20 520 0400. Rijksmuseum – A showcase of Holland’s Golden Age through art. Inspiring, thought provoking, and exhausting, this not to be missed presents some of the country’s richest treasures as well as some priceless paintings. Purchase tickets online to avoid long queues or plan to visit after 4.00pm in the summer months. Rijksmuseum, Jan Luijkenstraat 1, 1071 CJ Amsterdam. Anne Frank House Museum – A very personal story. Learn about Anne and her family and friend’s lives in the secret hiding place at the top of this famous warehouse building. Audio and video exhibits enable visitors to reimagine their experience. Climb the secret stairway to the attic and to view original clippings Anne placed on the walls of her room. Question your own morals and thought processes around discrimination and respect at the interactive ‘Cast Your Vote’ video presentation. To avoid the long queues that occur outside book tickets online in advance or arrive before 9.00am or after 6.00pm. Anne Frank House Museum, Prinsengracht 263-267, Amsterdam. Van Gogh Museum – Here you can come face to face with many of this famous artist’s iconic self-portraits and landscapes. In addition to the work by Van Gogh, the museum has a rich and varied collection of other 19th-century artists’ works including friends and contemporaries of the artist. Works by artists who inspired him such as Gauguin, Manet, Monet, Millet, Seurat, Rodin and Toulouse-Lautrec are also on show. Visit on a Friday night and you will find the foyer is converted into a bar with live music and DJs. Van Gogh Museum, Paulus Potterstraat 7, Amsterdam. Tel: +31 20 570 5200. Hermitage Amsterdam and Amstelhof – A taste of St. Petersburg in the Netherlands. For more than 300 years this location was a home for the elderly but in 2009 it became a modern museum complex showcasing both stunning masterpieces on loan from Russia and featuring the history of Amstelhof. In addition to the permanent collections the museum also presents world class art exhibitions. Visitors can also enjoy a virtual tour of the extraordinary rooms of the Hermitage in St Petersburg, Russia by viewing films and using touch screens. Hermitage, 51 Amstel Amsterdam. Tel: +31 20 530 7488. Tulip Museum – Amsterdam’s flower power. Tulip season in the Netherlands may last from late March to mid-May but tulip mania lasts all year long here. Amsterdam Tulip Museum features everything you need to know about tulips from history and cultivation to art and cultural values. The museum shop offers a range of tulip inspired gifts as well as the bulbs themselves. A service is also available where the museum can post the prized bulbs to your home country. Amsterdam Tulip Museum, Prinsengracht 116, Amsterdam. Tel: +31 20 421 0095. Amsterdam (Historical) Museum – Step back in time at the Amsterdam Historical Museum, also now known simply as Amsterdam Museum. It is handily located just a short walk from Dam Square. This fascinating museum offers an insight into the rich history of this incredible European capital city. The story is told to you chronologically and spread over three floors of an impressive ancient building which once used to be the city’s orphanage. From religion, folklore and art to subcultures, entertainment and prostitution – the city’s amazing history is revealed in the most enlightening way. If you thought history was boring then this museum will change your mind. Amsterdam Museum, Kalverstraat 92, Amsterdam. Jewish History Museum – Located in the heart of what was once Amsterdam’s thriving Jewish Quarter, this incredibe museum occupies what is actually a complex of restored Ashkenazi synagogues – the Nieuwe Synagoge (1752), Grote Synagoge (1671), Obbene Sjoel (1685) and the Dritt Sjoel (1700-78). These beautiful buildings incredibly survived Amsterdam’s Nazi occupation of Amsterdam during World War II almost completely intact. Unfortunately of the 80,000 Jewish people removed by the Nazis from Amsterdam, only a very small number survived the concentration camps and were able to return to their city. The museum tells the complex and fascinating and extremely moving history of Jewish culture and religion in the Netherlands. It also provides an insightful journey into the Jewish way of life over many centuries. Everyone is welcome at this important city museum and the excellent café is also certainly worth visiting for some delicious and inexpensive kosher food. Jewish History Museum, Nieuwe Amstelstraat 1. Stedelijk Museum – The newly refurbished Stedelijk Museum is also located in Museum Square. Here you can mingle with the great artists of the 20th century including pre-war works by Picasso, Cézanne and Matisse post-war creations by Lichtenstein, De Kooning and of course Warhol. You will be wowed by the mix of old and new in the building’s newly futuristic extension. Some say it resembles a plastic take-away tray for chips whilst others see its huge white form as a futuristic architectural step in the right direction. Stedelijk Museum, Museumplein 10, Amsterdam. Diamond Museum – This sparkling museum showcases the famously precious gemstone. Here you can see diamonds in their raw unpolished form before being turned into sparkling jewels by trained crafts people. Watch the diamond cutters and polishers at work whilst guides explain the processes to you in detail and answer all your questions. For a more economical visit providing much the same information pop next door to Coster Diamonds (owned by the same company) which is free to look around and no less dazzling. Diamant Museum, Paulus Potterstraat 8. NEMO – Inquisitive young minds and fidgety fingers will be rewarded at the wonderfully creative Science Museum, also known as NEMO. Here you can fiddle with the interactive exhibits as much as you like as there is a strict ‘hands-ON’ policy. The broad subject matter spans science and technology whilst taking an interest in industry, magnetism, biology and genetics along the way, to name but a few. It’s extremely unique and unmissable copper green exterior rises out of the water like the giant bow of a ship. Why not join local Amsterdammers on the roof for a spot of sun bathing or to admire the wonderful view across the city? Nemo, Oosterdok 2, Amsterdam. Artis Zoo – One of the most popular museum-like visitor attractions in the city is the amazing Artis Zoo. It may be one of the oldest zoos in Europe but its standards of care for the animals living here are exceptionally modern and as comfortable as possible within a contained environment. Here you will find all your favourite animals including tigers, giraffes, elephants and of course lots of monkeys. There is also a small petting area where children and adults can interact and feed animals more local to the Netherlands including goats, sheep and chickens. A particular highlight is the charming butterfly house where thousands of butterflies flutter around you beautifully. If you stand still long enough they will bravely land on you and eat fruit from the palm of your hand. The gift shop is of course packed with all kinds of unusual animal toys and gifts. The excellent zoo café is also certainly worth stopping off at for a bite to eat during your travels. Artis Zoo, Plantage Kerklaan 38-40, Amsterdam. Hortus Botanicus (Botanical Museum) – This beautiful paradise-like museum of unusual plants from all over the world is the perfect place to visit on a cold or rainy day. Inside the great glass hot-houses you will see some amazing lush rain forest-like environments and walk amongst huge tall cacti. You can even see wild cannabis growing outside in the gardens. Hortus Botanicus, Plantage Midenlaan 2a, Amsterdam. Heineken Experience (Heineken Museum) – This extremely popular museum attraction tells the history of Holland’s most famous bottled export. You will learn about how the alcohol is brewed and even have your own name or a message printed on to your very own Heineken bottle and label. Heineken Experience, Stadhouderskade 78, Amsterdam. Houseboat Museum – Many people are completely enthralled by the pretty houseboats on the city’s many canals. If you have any questions about life on the water then pay a visit to the House Boat Museum at 296K Prinsengracht. Visitors can climb aboard this pretty House Boat called the Hendrika Maria and find out what it really feels like inside. You will be surprised how spacious and comfortable it really is. Houseboat Museum, Prinsengracht 296K , Amsterdam. Olympic Experience Amsterdam, Olympic Stadium – The amazing Olympic Stadium was built for the Olympic Games in the summer of 1928. When completed the stadium had a capacity of 31,600. After the event it was used by AFC Ajax until 1996. Today it functions as a popular sports museum known as the Olympic Experience Amsterdam and is certainly an ideal visitor experience for any keen sports fan. Olympisch Stadion, Olympisch Stadion 2, Amsterdam. Other more unusual, but no less interesting, museums to explore within Amsterdam’s historic centre are listed below. Their subject matters of each museum need little explanation. Note: This information was accurate at time of posting. Please be sure to confirm details directly with the museum before making plans. By James Fisher.